Asendia is jointly owned by La Poste; the national postal operator of France. So we are uniquely positioned to help you in this important destination. France is one of the largest e-commerce markets in Europe and also very attractive for publishers and direct marketers. 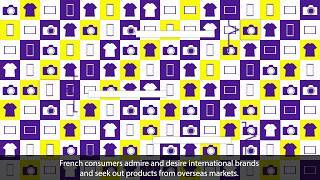 Targeting French consumers represents a clear opportunity in cross-border retail, especially as the French have a love for European brands and quality products. Why Enter The French Market? If you’re looking to reach a big consumer audience, in a retail market with similar trends and rules to other European markets, and where e-commerce continues to grow from strength to strength, France should be high on your list of prospects for sales success. How Asendia can help you export to France. And about the French e-commerce market. Learn about retail trends in France. Learn about what French consumers expect. Asendia’s cross-border e-commerce solutions are here to help you grow your business internationally. Through its parent company La Poste, Asendia knows France inside and out, so we’re well placed to offer advice on how best to succeed in France. With direct access to all of La Poste’s services, Asendia can provide you with solutions tailored to your needs. La Poste offers an excellent delivery and pickup network for efficient consumer delivery, based on its longstanding experience as national postal operator. Our Premium Goods service is delivered by Colissimo, the leading delivery service in France, who are trusted by French consumers, giving you a leg up on the competition. This service is for parcels weighing up to 30kg aims to ensure the best experience for both senders and recipients and is designed with e-commerce in mind. It offers delivery, return and tracking options to suit your preference and the greatest convenience for your customer. La Poste offers full tracking of parcels sent via this trusted service, ideal for customers who want to see where their parcel is on each stage of its journey. Asendia can provide different solutions to deliver your small goods (up to 2kg) with several options for delivery, including Personal delivery and Mailbox delivery. Asendia can provide different solutions to deliver your small goods in the most cost-effective way and with priority lead times. Goods from outside the EU will profit from efficient postal clearance solutions and we will minimise the customs and VAT charges for your low value goods. This service is ideal for low-value goods, as there is no tracking information. Asendia offers you expert knowledge and tailored Direct Mail & Business Mail solutions to help you grow your e-commerce business faster. France represents the third-largest e-commerce market in Europe, just behind Germany in terms of e-commerce sales. Even better, that figure just keeps on growing - e-commerce in France is expected to be worth over €100 billion euros in 2019. This makes France an ideal choice if you're looking to expand your e-commerce operations across Europe, with it's market size of 67 million people and close proximity to the UK. 80% of 25-45 year olds made a purchase online in the last 12 months, showing that French consumers are willing to go online to get the products they want to buy. Even more promisingly for companies in the UK, 40% of French purchases in 2018 were made cross-border, and with 38 million online shoppers in France, that represents a great opportunity. This number is expected to rise over the coming years, with an estimated 42.2 million online shoppers in France expected in 2022. E-Commerce in France has been growing rapidly, making it an ideal destination to sell to from the UK. Find out more about the opportunity, and how Asendia can help you deliver to France in our video. France is a natural export partner for UK businesses and is a lucrative market to explore, especially for online retailers. E-Commerce is growing in France, making up 4.22% of France's total GDP in 2018. With 71% of the population owning a smartphone, and 81% using a desktop or laptop computer, the vast majority of French customers can buy or browse online. As a result of competition, customer experience is increasingly coming under the spotlight in France. It needs to - Forrester Research has gone as far as labelling customer service in France “dismal” – and getting worse – in its latest Customer Service Index. Perhaps because of this, French customers return a lower percentage of goods than other European countries. Global retailers can use this to their advantage. Amazon, for example, was the most acclaimed brand in Forrester’s report, largely based on its wide offer, speedy delivery and its reputation for reliable customer service. Price is key for many French consumers, especially since the global economic downturn. According to Euromonitor, 80 per cent of French consumers compare prices before purchasing non-grocery items. It’s no wonder then that online shopping – which offers the opportunity to shop around for the cheapest price – is growing so strongly. It’s increasingly common among nearly 83 per cent of internet users – with little difference between the habits of men and women. That rises to more than 90 per cent among those aged 25-49. Although FEVAD’s latest figures show average spend per transaction has started to fall (now at €70), that’s more than offset by a growth in shopping frequency. Online shoppers make an average of 28 purchases each year, at a total value of €2,000 – with clothes topping the list of products they buy, followed by shoes and beauty items. Consumers in France like using bank cards to pay online, keeping payment relatively simple for international retailers to crack. Some 94 per cent of those aged over 15 have a Carte Bancaire – and 85 per cent of shoppers use them as their preferred method of payment online. There are also about 8 million PayPal accounts in France. The French are becoming more comfortable with the idea of buying online from other countries – with this most often driven by price, better conditions and availability. According to International Post Corporation (IPC) research, China, Germany and the UK are the most popular destinations. But take note of a warning from E-commerce Foundation: a website in a foreign language or badly translated into French has little chance of succeeding. There are a number of delivery options available in France, from Colissimo's premium goods service to standard delivery via La Poste. This wide range of options allows retails to offer a lot of flexibility to the customer. Asendia are able to offer all of these options, making them an ideal delivery partner for your business. The French lead the way in the popularity of pick-up points close to consumer homes, including at post offices, local stores and in lockers in railway stations. In fact, the option is now on a par with home delivery. This highlights the need for retailers to prioritise consumer convenience when considering delivery options – and the importance of offering a choice. Reliability is also as important as speed. French consumers are accustomed to the reliability offered by the postal network and expect online retailers to meet their expectations. This means they often require reassurance about delivery, from being given all the relevant information up front to having the option of tracking their goods. Research from the UK’s Royal Mail highlights that this is far more important in France than it is in the UK – 85 per cent would ideally like to track every order (versus 60 per cent in the UK), rather than just high-value items. The Royal Mail also found that French consumers are most influenced by the offer of free returns. And although overall returns numbers in France may appear low at six per cent, this rises to 20 per cent in some retail categories, such as fashion – and 40 per cent of French consumers think existing returns procedures are overly complex, offer an opportunity to those willing to implement simple returns procedures for French customers. Even so, the low overall returns rate makes France an excellent choice for retailers looking to sell goods online. Get in touch with Asendia to start delivering to France!